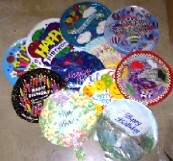 Assorted 18" Get Well, Anniversary, & Birthday Foil Mylar Helium Balloons. Balloons are self sealing. Assortments will vary. Build your inventory selection with minimal investment with Balloon Assortments.